On January 30 2019, in his first Van Lier Fellow performance, composer/bassist Nick Dunston presents his quintet, Atlantic Extraction, completed by Louna Dekker-Vargas on flutes, Ledah Finck on violin, Tal Yahalom on guitar, and Stephen Boegehold on drums, along with the world premiere of The Floor is Lava!—a work written for five double basses featuring the diverse talents of Kanoa Mendenhall, Almog Sharvit, Eva Lawitts, and Lisa Hoppe. 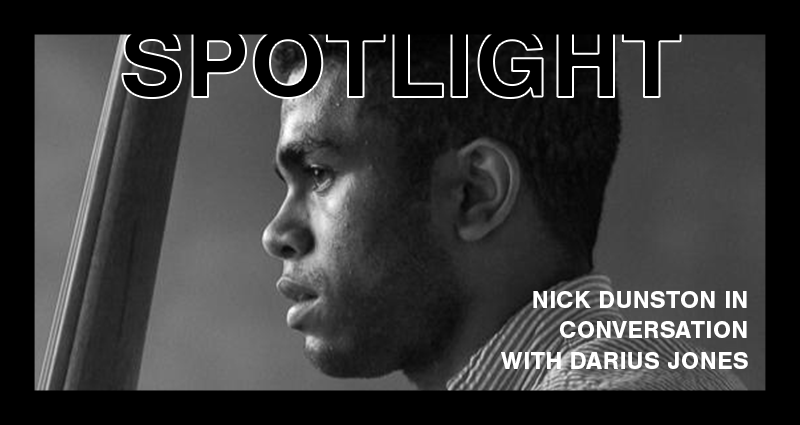 Darius Jones: Who is the Brooklyn-based composer, bassist, and scholar named Nick Dunston? Nick Dunston: Well, I grew up in New York City—I was born in DC and moved here when I was four. I started off as a cellist. I guess my start in music wasn’t really for any “good reason;” my mom made me play cello, and the first time I switched to electric bass was because I just wanted to be cool. That’s really what it came down to. It took me a while to develop a sense of discipline in working hard at anything, really. My parents stressed the importance of at least working hard in school from an early age. My mom is Puerto Rican, and my dad is African-American, so they really stressed the importance of making sure you represent yourself in the best way possible—fighting the social odds against you. Even still, in music, I wasn’t super disciplined at first, and I had to develop that as I got into high school. As I spent more time actually practicing, motivating myself, and forcing myself to see things that was hard to do when I was younger—that’s really what contributed to my love for music: working harder and seeing that work actually pay off. So yeah, that’s how I got started with the actual discipline of it. I spent a lot of time as a kid not really hanging out with a lot of other kids my age. I really just daydreamed all day. I didn’t do much; I kind of would play ridiculous, fantastical scenarios in my head. ND: I was into superheroes. I would spend time imagining superheroes or fantasy worlds—nerdy stuff like that. I played some video games, but I really just liked imagining creatures or people. And it’s not like I had a bleak childhood, I mean I was living in Brooklyn—it was all cool. But yeah, whenever I was walking around or doing anything, my mind was going-on with ridiculous, otherworldly thoughts and images and scenarios. I think that’s what allowed me to constantly churn out new music as a composer: there’s really no shortage of ideas and stuff that I see as valid. I’m so used to always re-imagining and re-imagining things and going back to things that I imagined years ago and developing those in my head. When I realized that I could be a composer, that mindset manifested into music. DJ: When did you become aware that you could be a composer? ND: It started in the beginning of high school. I played in a rock band before that in middle school. The band wrote songs together, and I would make up my own bass lines. I don’t know why, but at the time, I never thought of that as composition; I thought of it as just playing the bass. I think I realized it when I went to high school—I went to an art school. I would be sitting in the library and because I’m constantly playing stuff in my head, I would transcribe it onto manuscript paper. I don’t think of it this way now, but back then I was thinking, “oh, because I’m writing this down, that makes me a composer,” in a traditional sense. So since then, I’ve been working to deconstruct that idea because I was still pretty ingrained with a mainstream, eurocentric idea of what it meant to be a composer at that time. DJ: So what is your compositional and instrumental process? How do you feel your process as a composer and instrumentalist leak? ND: So, as a composer, it can start a number of ways, but typically I’ll solidify a really basic idea, whether it’s something as vague as a rhythm or a series of pitches or even just a really general sound. I’ll take between one and three of those and solidify them either by recording it into my iPhone or singing it or writing it on paper—or writing the idea of it. Then I try to work with as few materials as I can to try to see how much I expand each one. Once I’ve sort of developed or brainstormed on a certain idea, I’ll try to make up a large-scale form. I’ve spent a long time doing that and really working out the form and basic order of events. At that point, it’s kind of just filling in blanks and seeing what makes sense. When I’m actually sitting down and composing, I try to take advantage of the one thing that I don’t usually do when I’m improvising and set up a goal and destination. That way I can pace myself and work my way towards those. That’s what I’d say my general process is as a composer. As an instrumentalist, I used to start by warming up on the bass, making sure that the physicality of it is already there, but I’m starting to drift away from that. I’m finding it’s better for me if I start on the bass with a more musical approach, then blend it with the physicality of warming up. I think that the first thing I do on the instrument needs to be something more than just a physical approach. The physical approach is super demanding and super taxing. There are new things I’m doing like yoga to help me with that. But I think when I actually have the instrument, I need to start with an artistic kind of statement. Oftentimes, I’ll improvise for a stream of five to twenty minutes. DJ: What are you trying to communicate with your ensemble Atlantic Extraction? ND: Atlantic Extraction is the first band I’m leading as the sole leader. At first I was thinking about what kind of band I wanted in a general sense—a large or small group—before eventually settling on a quintet. It forced me to be really inventive with the way I compose for improvisers because not everyone in the group comes from the same idiom of improvising. Half the band members are classical musicians who have different ways of approaching improvisation. At first, we didn’t really know each other that well, so it has been about developing a personal relationship, as much as a musical one. That was something I did on purpose—I wanted to grow a band instead of finding one. It’s easy to find a band in our community, but I really wanted to build something from the ground up. We’re never going to escape our models or influences—and I’m not trying to reinvent anything, necessarily—but I find that by growing this band from the ground up, I don’t have a full vision of what we will be, but I’m realizing that it’s becoming clearer to me as we progress. There are things that are really surprising me about this band—there are definitely more curveballs than I had originally thought. I think the vision is also changing as the band grows. Whereas, if I started the group knowing what it would sound like or having any really strong expectations, I feel the whole process would be more about fulfilling that expectation rather than allowing for growth and evolution. So far it’s going great. It’s felt very trusting, very open, very vulnerable, and I’ve been surprised so many times with the music that we make. I think that’s because I freed myself from expectations. DJ: Why did you choose the instrumentation for Atlantic Extraction? ND: Well, some parts were functional, and other parts of it actually didn’t have to do with the instruments, at first. For functional reasons, I knew I wanted to do drums[Stephen Boegehold] and guitar [Tal Yahalom]—there are lack of pianos in New York—and really I’m very happy with letting that dictate some of my forms. I met Louna Dekker-Vargas who plays flute and Ledah Finck, a violinist and violist, a couple of years ago at the Imani Winds Chamber Music Festival. I was there as a composer, and they were there for another project. I knew that I wanted to play music with them in some kind of capacity and Atlantic Extraction made sense because they don’t play rhythm section instruments, in the conventional sense. That was the only functional requirement that I was looking for to fill rest the band. I’d always been interested in classical music and chamber music which is where I heard these instruments first, so I think that elevated the idea that it was kind of an unconventional instrumentation. It didn’t really register to me as that at first, but now that I look back on it it makes sense where it came from. DJ: It’s a cool front line—flute and violin—it’s really cool. Essentially, as you said, you have this conventional rhythm section that we’ve seen before, but then this front line that is really unique. ND: Yeah, I know a ton of saxophonists who double on flute and who play really good flute, but it’s not the same. It’s also interesting writing something where flute is the only possible option. It gives me puzzles to work on. DJ: I can hear that in the music. The fact that you are saying, “I have to write for flute; I have to write for violin,” seems to be influencing the whole compositional process. ND: Very much so. I really like puzzles and so in some ways it’s a balance of being really strategic and a game-maker. But another part of me is really into the idea of giving myself a slab of work and then working my way through it and treating everything like puzzle. DJ: What’s the compositional approach to the ensemble? ND: There isn’t any single approach, but as of recently, a bit for this ensemble and for another new group,I’m dealing with some timer stuff—stopwatch stuff—and gestural stuff. I’m experimenting with this notational approach where I’ll have between one to three simple themes. I’ll have those kind of off to the side – theme one, theme two, theme three. The rest of the notation is gestural – giving just information that is needed to execute the general realm of what I’m hearing while making room for the improvisers. It’ll look like, bass one and bass two play theme one and then there will be another part that says go down then they’ll go on. Then it’ll say sax one play long tones against this and I’ll be as specific as that. It’s this unfolding of people doing really basic tasks, but they to commit it and as they hear what’s going on against it they’ll naturally gravitate towards playing together. DJ: How much do your personal aesthetics inform your decisions at this point in your career? ND: I’m finding that it seems like my decisions are informing my aesthetics. I’m recently finding that I’m more into quirky, fucked-up stuff than I thought I was, but I only came across that by composing what felt right. I don’t really feel like my aesthetics, when it comes to composition, is predetermined. It feels more like I compose and then I’m like oh, okay. DJ: Do you feel like the things you are aesthetically attracted in your work are being reflected in your choices and in the decisions that you’re making at this point? ND: In terms of my life around music, yes. Over the past year I’ve been particularly introspective and doing weekly therapy sessions to kind of figure out myself and work through stuff that I haven’t really worked through in my life. I’m finding that by putting my work at the center of my life and focusing on that, everything else falls into place around it, particularly as it relates to my direct community and really investing in those relationships with people whether it relates to music or not. I’m working on finding a marriage between my personal life and musical life. Recently I have been placing a lot of importance on my relationships with people and that approach has heightened my understanding of who they are as musicians and I think has refined and increased my own awareness of who I am as a musician, whether it be as a composer, as a leader, or as side person. DJ: What are a few things that influence your work besides music? ND: I really like movement-based activities. That could be dance but even stuff that is found more in everyday life, like looking at the way people walk. My mom would always tell me to make sure I sway my arms when I walk. When she saw me walking with my arms straight down, she would always say, “walk with your arms in movement.” She was always nagging me about that, and my posture, and generally the way I present myself. She was teaching me about body awareness and now, body alignment is always on my mind. I’m fascinated by it. Whether it be in dance, the way people walk, the people’s posture, or body language really interests me. DJ: Do you have a code that you live by? ND: I never thought of it in that specific word, code, but I would say that yes—always believing in myself with one hundred percent conviction and commitment and really doing things on my own terms. I’m still learning about other traditions and other systems, but ultimately not letting any hierarchies or ways of making music dictate my work or who I am as a person. I’m creating my own standards and my own terms, and how I present myself as a person. DJ: Now that we’ve reached the end, are there any questions you wished I would have asked? ND: I mean I still have, you know, tons of anxiety about the way I declare myself as an artist and the person getting solidified. I thought you would ask more questions, but I’m glad you didn’t, haha. DJ: No no, it’s because—well, how old are you? DJ: Yeah, man, I didn’t know what the hell I was trying do at twenty-two. I had an idea, for sure, but you know—at forty thinking about the kid at twenty-two, man. It’s light years. I would say, you are in a very different place than I was, but it’s great that you’re letting it flow, and I think that’s the right way to be at twenty-two. ND: Yeah, I’m trying to work hard and be kind to myself and follow my interests. DJ: One question I would like to ask you end it—there seems to be a large group of young, really interested, really talented players with vast perspectives on making work coming up right now. I mean you guys are kind the early twenties crew of cats that are in the interesting position of not being bogged down to any type of style or path. It seems you can do whatever really truly interests you. How do you feel about that? ND: It’s exciting, but more so, a huge responsibility. I think it’s partially because of the huge open lines of communication and, arguably, lack of privacy. There’s just so much communication, such fast communication—and tons of people in the generation or two above us who are generous with their time and their thoughts, like yourself. We have so many resources, so it’s exciting to see what people are doing with these things, but it’s also a huge responsibility because it’s like, Okay you have all this stuff. We’re laying out all these ideas and influences here for you—here you go. Get to work. What are you going to do with them? DJ: Exactly. Get to work. I like that. Darius Jones is a critically acclaimed alto saxophonist and composer. In 2008, Jones was awarded the Van Lier Fellowship by Roulette, which he used to launch his chamber ensemble, the Elizabeth-Caroline Unit, a project dedicated to new works for voice. Roulette continued their support for Jones’s work through a Jerome Foundation Commission, awarding Jones an Artist-in-Residence opportunity for the Elizabeth-Caroline Unit to premiere his vocal composition, The Oversoul Manual, in spring 2014. Following that performance, Jones made his compositional debut at Carnegie Hall with The Oversoul Manual in October 2014. Jones has collaborated with Gerald Cleaver’s Black Host, Oliver Lake Big Band, Eric Revis Quartet, Nasheet Waits Quartet, Trevor Dunn’s Proof Readers, Matthew Shipp, Branford Marsalis, Jason Moran, and more.